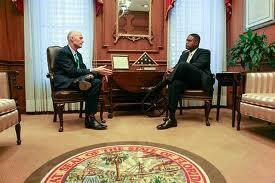 Governor Rick Scott chats with Florida Education Commissioner Gerard Robinson in this undated photo. 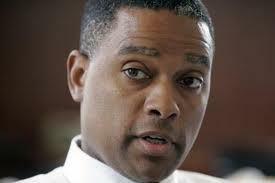 Robinson says he’s leaving the Department of Education to spend more time with his family. Before coming to Florida, he was Virginia’s education chief, and that’s where his wife and children still reside. He’s lived apart from them for the last year. During that time he and his agency have been criticized for the way they’ve handled changes to the Florida Comprehensive Assessment Test, or FCAT, test that resulted in lower scores for students and schools. Despite that, Governor Rick Scott even expressed some sadness about Robison’s decision to leave. But others disagree with that assessment of Robinson’s job performance. “He basically defended the Department of Education and the approach they are taking and ignored the very real concerns that parents and teachers and administrators had," said Florida Education Association Spokesman Mark Pudlow. Education officials had to go in twice to revise grades—first for the FCAT writing test, which more than 70 percent of students failed, and then to fix some 200 school grades. Robinson defended Florida’s education policies even as opposition to the test increased. Parents complained and school districts passed resolutions—some in complete opposition to the test and others demanding changes to the way it’s used. And those who disagree with Robinson’s approach to education say they’d give him a failing grade. Sound- “It would be wonderful if the powers that be-- the governor the legislature and the state board of education—took the time to reach out and talk with teachers, administrators and parents about the education system in Florida and see what we can do to improve it," Pudlow said. Robinson will step down at the end of the month and the person who will take his place will become the state’s third Education Commissioner in less than two years. The Department of Education isn’t the only agency that’s seen a high rate of turnover. The newest state agency, the Department of Economic Opportunity is also on its third director. The Departments of Corrections, Health, Management Services, Revenue, State, Elections, and Agency for Persons with Disabilities have all seen turnover at the top level. “Well overall there’s been quite a bit of exodus for those working under the Governor," said State House Minority Leader Ron Saunders. Several agency heads stepped down earlier in the year, citing clashes with Governor Rick Scott’s Chief of Staff Steve MacNamara who has since left his post as well. But there are other factors to consider as well: people may be well trained in management, but in today’s political climate, agency heads are also dealing with lawsuits and complaints. “So many people are really down on government. They don’t like government employees they don’t like agencies, and the complaints against operations against high-profile agencies complaints are on the upswings. It’s really not the best of times or the most rewarding time to be a top level administrator in a high profile agency, regardless of the state," said University of South Florida Political Scientist Susan McManus. These high-pressure, high-profile jobs can easily lead to burnout. It’s not unusual to see people leave closer to the end of a governor’s term. But what’s different now, is that the rate of turnover is happening when the Governor has been in place only about two years. The Governor’s office says it has no comment on the number of agency head departures nor will it speculate on why top officials have chosen to leave. The office has announced its newest pick to head a state agency. Barbara Palmer is set to lead the Agency for Persons with Disabilities. She comes from the Department of Children and families, and will become APD’s fourth leader in under two years.